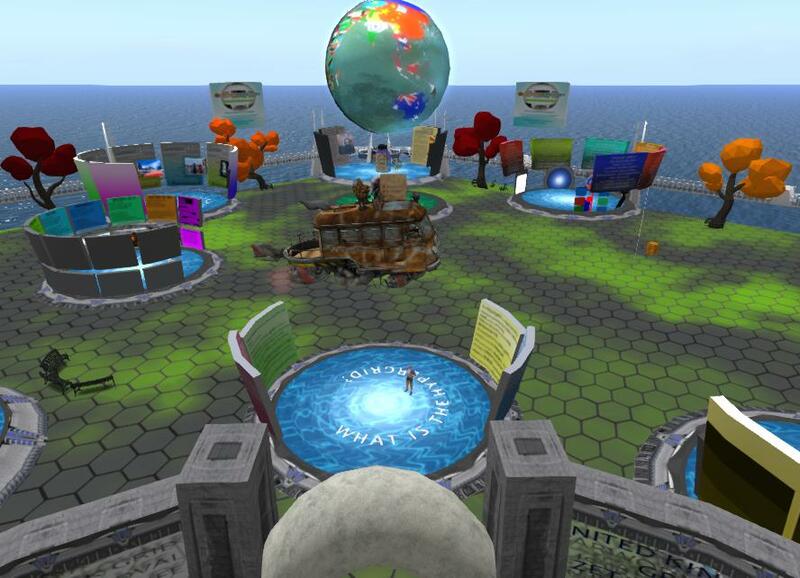 The Virtual Worlds Fair is off to a start with 5 venues of exhibits built for OSCC, but remaining till the next OSCC. Here I put the layout and main exhibits on the web to get wider availability. And to try out a way to increase the public visibility of exhibits in the VWFair. HG Chamber of Commerce: How about a Virtual Worlds Fair? The interactive whiteboard offers various features of value in the classroom. Since I believe web-worlds can be useful as classrooms on the web, I am here describing the capabilities that web-worlds already offer that give affordances similar to those offered by interactive whiteboards. Anyone can type a message on the Cybalounge message board. The Cybalounge developer may respond to questions on it. You can make one like it: Web-world message board. You can drag/drop your message board into your Cybalounge world. You get a free Cybalounge world by registering in Cybalounge. Polling an audience for opinions. Cybalounge offers most services commonly ascribed to interactive whiteboards. Does a myth report something that actually happened? That question totally misses the point. A myth is instruction, not a news report. A myth tells people in a particular culture something that is a generally accepted belief in that culture. In this time of global crisis and transition – mass migration, inequality, climate change – Alex Evans believes it is only by finding new myths that we will navigate our way to a better future. It is stories, rather than facts and pie-charts, that have the power to animate us and bring us together to change the world. Kitely market adds features that support some after-market services to customers. That adds another reason why people might prefer to buy from Kitely market over an inworld shop. Easily deliver product updates to everyone who previously bought the product. With a feature called Batch Redeliver. Resend previous orders to a Kitely avatar. Lets sellers replace items lost through grid closure. Did the closure of Zangrid result in loss of items bought on Kitely Market? We have known all along that the only way to get rid of your fears is to confront them. But how can schizophrenics confront those voices in the head? 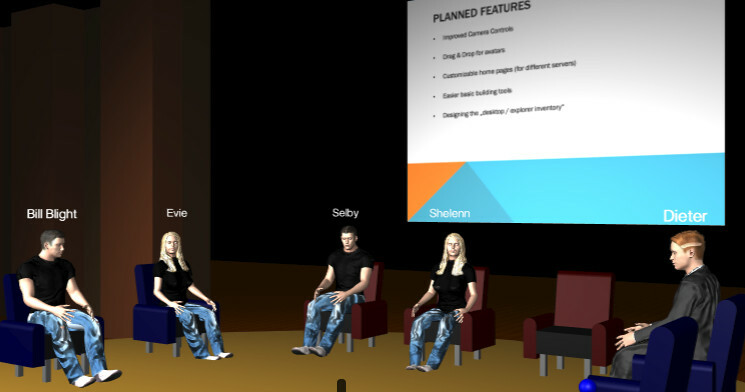 This therapy gets those virtual voices into virtual avatars, where the patient can confront them. It seems to work. This therapy reduced distress and frequency. "Everything is already known. Your job as a student is to learn most of it and demonstrate your recall by reciting back bits of it." We would never teach that. These days, much of what we have to do is respond to new challenges. A lot of the misery is delivered by the difficulties people have in responding to new challenges. With all that in mind, how does the traditional classroom model compare with the challenge model? Announcing the bi-weekly meeting of the web-world users/developers meeting every other Friday. Anyone interested in web-world development is welcome. 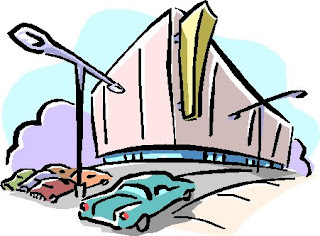 We meet in a browser--that's the convenient thing about web-worlds: Drop by, come in as guest. No registration. Anyone interested in web-world development is welcome. Dieter will disclose future developments, get suggestions and problems. Webworldz lets you choose your face. Selby has office hours weekdays at 12-12:30 US central time. Another serving of comedy in virtual worlds. Catboy has a nose for news and he wipes it at Lauren's place. You, too, can do comedy at Lauren's place. Video introduction to Virtual Reality Occupational Therapy. Virtual Reality Occupational Therapy is HERE!! The purpose of the virtual reality OT sessions is to allow access to occupational therapy anytime and anywhere. Whether you are in a region that occupational therapists are sparse, or your're a therapist and you want your clients to be removed from the humdrum of the clinic, school, or their home, VR-OT is for everyone. 2017 EDU: We are wired to innovate. Do Schools teach creativity? Why We're Wired to INNOVATE. Do schools teach innovation? I see that it is available in support of advanced and specialized degrees, but most of my education seemed to be directed at getting me to know what previous generations already knew. All the new innovations we're surrounded with have a history, but how do we manage to evolve these ideas? David Eagleman and Anthony Brandt explain our ability to innovate our most profound, mysterious and deeply human capacity, enables us to go out to re-make our world. Aphasia is a loss of the ability to speak and/or understand language. EVA Park is a pioneering virtual world for people with aphasia, a language impairment that affects one third of people who survive a stroke. New aphasia research: What are the benefits of EVA Park? Eva Park is a multi-user online virtual world that gives people with aphasia unique opportunities to practise their speech and establish social connections. It was created at City, University of London, via a process of co-design where people with aphasia collaborated with researchers in human-computer interaction and speech and language therapy.